Alright. I know I’m late. You’ve probably seen every other girl wearing a pleated skirt in a million ways! You can pair it with graphic tees, sweatshirts, basic tees, bodysuits etc. But I paired it in a funny way just to have fun and experiment with my style! I basically wore a simple plain white shirt and instead of tucking it in, I tied a knot. I accessorized it with a statement necklace which will give an embellished look to your outfit. To add a pinch of color I wore the same thrifted sandals which I wore for a blog post during Diwali (click here) because nobody got time to go on a hunt for another pair of sandal. Plus point they actually went pretty well with the outfit so BONUS!! Just to add more dimension, as you may know, I’m a sucker for plain black or solid colored things. I wanted to go with something different this time. So I paired this cute striped crossbody bag. I also wore my gold & black sunglasses from Forever 21. I love this outfit so much, it’s so hipster & different than what I usually wear. I love how this one turned out! What are your thoughts on this one? 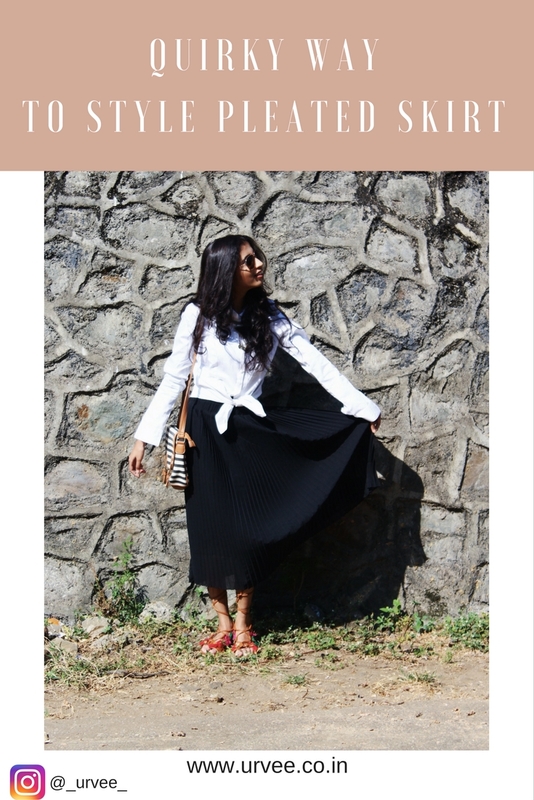 If you want me to style this pleated skirt on a much more sophisticated way then let me know! I’d love to do that 🙂 Come back every Tuesdays and Sundays for a new post! Where else to meet me! "10 Self Care Ideas which helped me."